Imagine saving $10,000, $50,000 or even $100,000 on your next build? That’s the power of an accurate building cost estimation report. 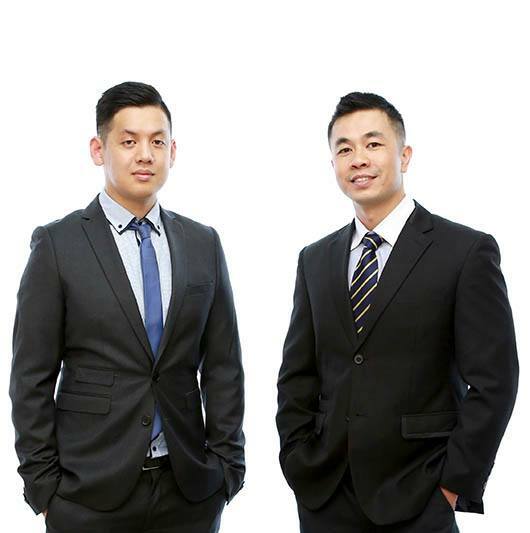 Hi, we are Hai Nguyen and Brian Truong founders of Newin Building Estimating Services, and that’s what we’ll help you do. We feel it’s our duty to give client’s the honest truth on what it’ll cost to build. Over the years we’ve seen clients get caught out with overpriced builders or simply inaccurate costings that sadly leave many financially strained. Our number one focus is providing you with a return on investment (ROI) on the reports you receive. And that means we’ll spend the time with you to identify opportunities to save and get the best bang for your dollar. Unlike other agencies, we don’t use cost guides as we don’t find them reliable for our clients. We believe in going much deeper to give you concrete data and rates so that you’ll feel secure with your budgets and the decisions you make.  Powered by 10 year’s + experience in the construction industry, we proudly service leading builders, architects and developers across Sydney and Melbourne as well as homeowners directly, that trust Newin Building Estimation Services with their building projects. We pride ourselves on being hands-on, affordable and eager to share ways on how you can bring your building project to life, with complete control, on-time and within budget. Building cost estimation reports aimed at delivering you a high ROI. Quantity surveying monitoring through all phases of your construction, meaning “no surprises”. Project Management expertise support for homeowners and builders helping you stay on track and budget. Custom made building consultancy servicing commercial, industrial and residential construction projects. Call us for a chat? We deliver diligent and accurate estimates and quantity surveys for your project. We provide services to a range of projects; commercial, industrial or residential construction projects. All estimating cost plans are easy to review with full breakdowns for transparency. We offer a quick 72 hr turn around time on all our estimation and quantity surveying services. Simply call or email us at Newin Estimating Services, provide us with the details of your project and any documentation which you may have at hand and we will review and respond with a quotation for the Cost Estimate. If you are satisfied and approve the quotation we will request a deposit payment which will be required before we commence your Cost Estimate. How long does an estimate take to produce? Following the approval to proceed and payment Newin Estimating Services will aim to have your cost estimate returned to you in 72 hours. Some estimates take longer than others, as the project may have specialist trades or additional requirements – the time frame for completion of each Cost Estimate will be given to you with the initial quotation. What format is the estimate sent in? The Cost Estimate will be emailed to your contact address, in .PDF format, for your review. Following review any changes can be made and a revision will be resent to you. Do you have a sample estimate to review? Sure, visit our Samples Page for an example of a complete Cost Estimates and trade Break-ups for different types of client. 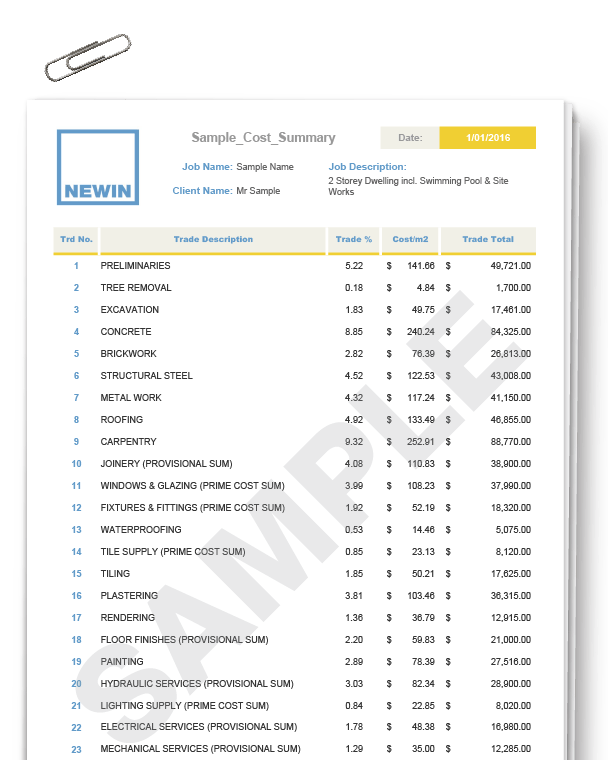 These are standard formats for each Newin Estimating Cost Plans. Can you guarantee total accuracy? We cannot provide you a full guarantee over every cost issued, as the Building and Construction Industry typically fluctuates with global and local markets and price indices. Every Newin Cost plan is however developed by a Quantified Quantity Surveyor with over 18 years experience and current industry working knowledge. 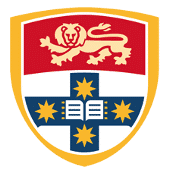 I need a timeline for my project, can you assist? Yes, we are able to provide you with an associated and accurate Construction Programme which is developed in conjunction with the Cost Estimate. 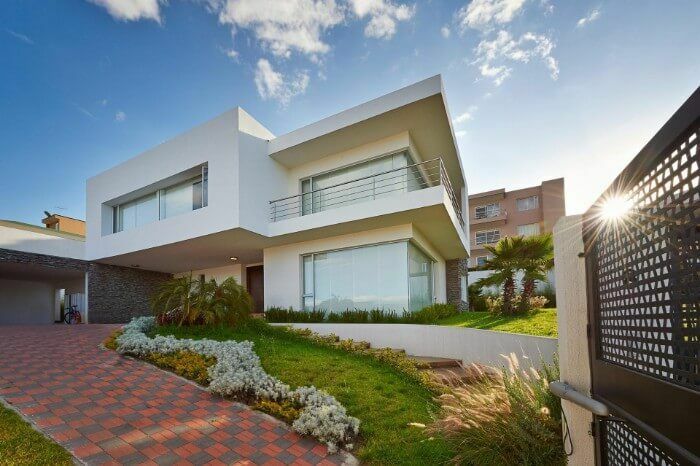 This is prepared by an experienced Construction Project Manager who will analyse the provided project documents and Newin Cost Estimate and schedule the works in the most efficient way possible. How do I deliver my project documents to you?